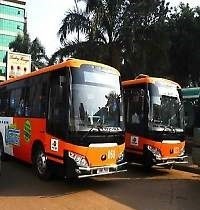 Kampala the capital of Uganda located in Central Uganda is preparing to have the city tour buses running towards the end of 2015 to enable Uganda safari undertakes explore the magical offerings of Kampala. Thus development is noted to be the first of its kind since the inception of Kampala and is seen as a positive move to revamp the urban tourism in Kampala and enhance the diversity of the tourism products in Uganda that can be encountered by travelers on safaris in Uganda. The arrangement which is going to be implemented under Public Private Partnership between the Kampala Capital Authority and the local proprietor Albrieux Africa tours with the aim of enhancing the attractiveness of Kampala City. Apparently, Kampala is regarded as the East Africa’s entertainment city and is one of the diverse cities on the continental lands of Africa. The Kampala social scene and the nightlife is the ideal in the region. The bars, theaters, live shows, culture bustling in the city from Monday to Monday combine to make Kampala a darling for a range of visitors including those that come on gorilla trekking safaris in Uganda. The heritage of Kampala makes it unique and special. It has remarkable cultural and historical attractions and which is spread on various city corners thus presenting an extended drive and the tour in the city. The tour itinerary of Kampala with the invention of the bus system will of course feature Baha’i Temple, Namugongo Martyrs Shrine, Old Kampala Mosque, Makerere University which is the oldest and the most prestigious University in north of River Limpompo, South of Sahara, East of Equatorial jungle and the west of Indian Ocean not forgetting the famous Kasubi tombs which is a world heritage site and one of the main products visited by cultural enthusiasts on Uganda safaris and tours. The supply of the city tour services followed the rightful procedures with the Kampala Capital City Authority expressing interest and the perfect bidder considered. The memorandum of understanding has been signed and the operator will offer the product for five (5) years. The provider is set to purchase two (2) brand new Ashok Leymnd buses with double decker. The ticketing booth locations will be at National Theater, near Independence monument, national museum and at the Kabaka Anjagala road. Kampala Capital City Authority has also identified a place for tourist information center, UWA Souvenir shop, craft shop, tour operator or guide’s offices and Offices for Uganda Tourism Board at the Jubilee Park at Sheraton Hotel. The city product aims at maximizing the tourism revenue and enabling the tourists to explore the areas that would be hard to access due to traffic. On global scale, the city tours are a way through which the visitors can have a picture of the life of the country as given by its city. It also adds revenue through the souvenir purchase and other spending on the short trips. The range of people can participate in this product including school groups, corporate groups, individuals, international travelers on safari in Uganda booked by tour operators and the walk in visitors. The conference and event attendees can also enjoy this remarkable product. Running under the theme Kampala Landscape and Cultures, the product will aim at bringing out the undulating landscape of Kampala and its historical heritage vested in its seven hills. With this, urban tourism in Kampala would have taken a step further in the right direction.